The Westland IV and Westland Wessex were high wing, three-engine light transport aircraft built by Westland Aircraft to carry four passengers, pilot and mechanic as well as luggage. 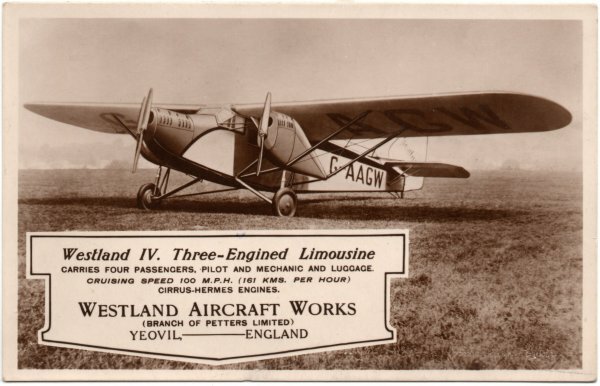 The Westland IV first flew on 21 February 1929 at which time it was powered by the 95 hp (71 Kw) Cirrus engine. This prototype was registered as G-EBXK and was certified for a crew of two and four passengers. The second machine had Hermes engines and a metal rear fuselage. 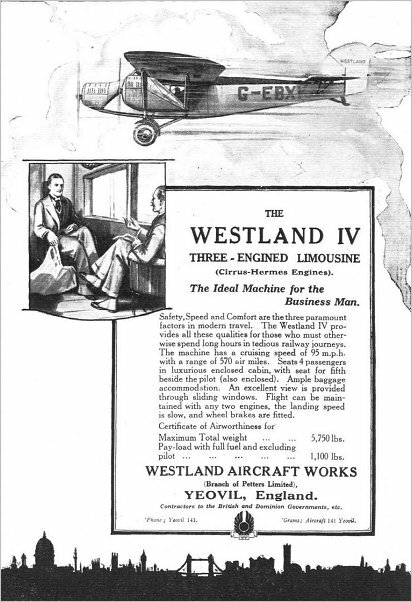 The third machine, G-ABAJ, was modified to take the 105 hp (78 Kw) Armstrong Siddeley Genet Major engines as well as some other changes and became the prototype Westland Wessex. The two Westland IVs were subsequently converted to Wessexes giving 10 aircraft in total. 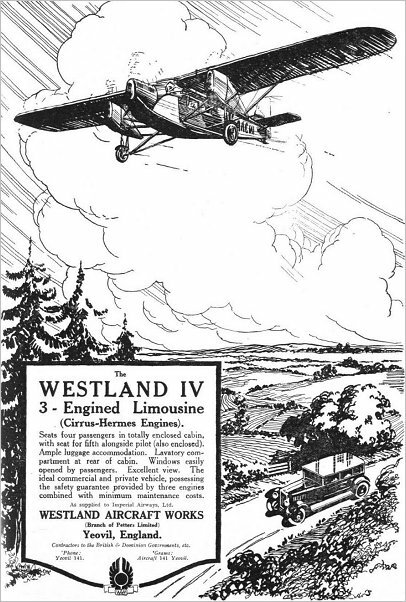 A 1920's advertising postcard of the Westland IV. In 1929 His Excellency Sheikh Hafidh Wahba - a Delegate from Hejas to the recent Postal Congress - visited the Works of Petters Ltd. The Westland IV, in which he took a flight, is shown in the background. Left to right, Mr EM Benjamin, Capt. Paget, Mr PW Petter (Managing Director of Petters Ltd), His Excellency Sheikh Hafidh Wahba, Mr All Shukry Bey, Mr TD Cree, Capt. RC Petter, Capt. Hill, Mr RJ Norton. Also in 1929, a group of RAF officers from Henlow were shown the home of the Wapiti and Westland IV. Flt.-Lt. Paget and F/O Brunton, who are test pilots to the Westland Aircraft Co., are on the right hand edge and third from the right of the photo. 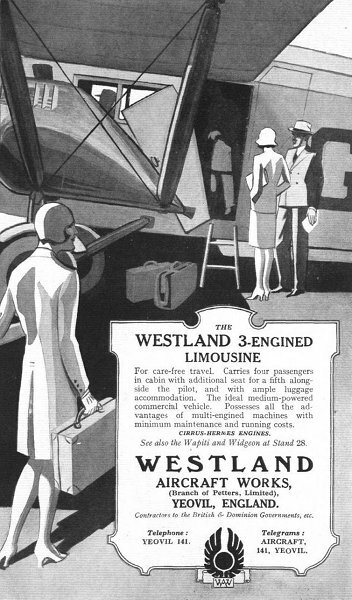 A 1929 advertisement for the Westland IV Limousine. .... and another advertisement from the same year. Finally, another 1929 advertisement clearly aimed at the young, trendy traveller.